Vanadium (chemical symbol: V) is a soft, grey, ductile and tensile metal which is proving to be one of the most precious commodities in the world. It has been used to strengthen and harden alloys such as steel and titanium, in petrochemical, catalyst, pollution control and ceramic applications and is increasingly being used in the advancement of battery technology. Vanadium redox batteries (VRB’s) are currently being developed and commercially deployed in industrial and grid storage applications. Lithium vanadium phosphate battery systems are used in the automotive industry. can release massive amounts of electricity instantly – and repeatedly. Although energy storage applications accounted for around 1% of vanadium consumed in 2012, these applications are expected to add significantly to demand for vanadium in the coming years. The predominant use of vanadium is as a strengthening and hardening additive in steel and some forms of iron. Only small amounts of vanadium are required to be added to steel to significantly enhance its hardness and strength (no more than 0.25% by weight to high-carbon steel or less than 5% by weight to steel intended for use in high-speed tools). High strength low alloy (HSLA) steels typically contain less than 0.5% V.
TTP estimates that approximately 60% of global steel produced is C-Mn steel, about 20% HSLA steels and 20% special high alloy steels. As a result, the market share of HSLA steel to total steel is expected to grow in the coming years due to the strong efficiency and economic and drivers which result from the replacement of C-Mn steel with HSLA steels. The steel industry currently accounts for 92% of vanadium demand. But with both China and Japan having mandated stronger rebar in construction, demand for vanadium in HSLA steels is expected to continue to increase. Vanadium is also used in the production of titanium alloys for use in the aerospace industry and other applications where there are no other metallic substitutes. Vanadium has the ability to allow titanium to perform better and at high temperatures. 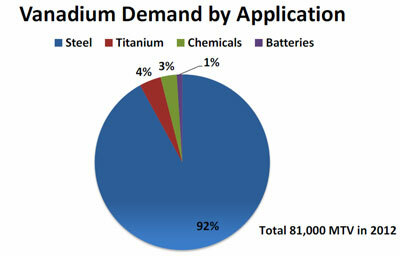 Titanium alloys accounted for approximately 4% of vanadium demand in 2012 and according to international metals consultancy firm TTP, titanium alloy production is in a strong growth phase, with this application expected to make a contribution to growth in vanadium demand in the next 5 years. 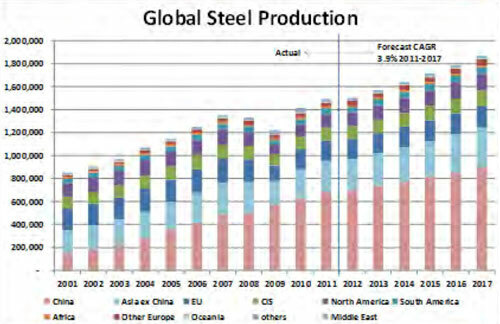 Global steel production was reported as 1,490,060 MT in 2011 and TTP estimates global steel production to grow at a compound annual growth rate (CAGR) of 3.9% between 2011 and 2017. 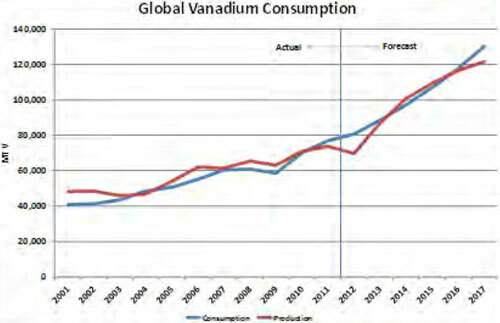 Based on projected changes in global steel production levels and projected changes in global specific vanadium consumption rates within the steel industry, TTP’s forecasts growth in vanadium demand at 9.2% CAGR between 2011 and 2017. 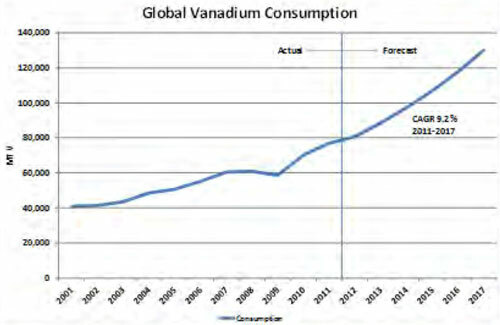 Total world vanadium consumption reached a record high of 78,000 tonnes in 2012. 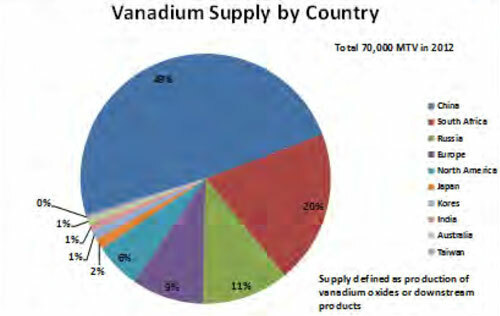 China is the main producer of vanadium currently accounting for 58% of world supply with South Africa the second largest at 15%. In 2006, China accounted for about 20% of world vanadium demand, rising to 34% by 2012. This was mainly driven by increased steel production in China over that period. Although China is a main world producer of vanadium, its new government regulations on rebar quality standards are expected to heavily impact the vanadium market. The new construction design codes implemented in China are phasing out Grade 2 rebar (reinforcing bars) which have no vanadium, in favour of Grade 3 rebar which require about 0.35kg vanadium per tonne of steel. An upgrade of rebar from Grade 2 to Grade 3 would require an additional 30,000 tonnes of vanadium per year. Another potential large driver of vanadium demand is VRBs for grid storage application. According to Lux Research, VRBs is forecast to account for 34% of the global large-scale storage battery market by 2017 which equates to US$38 billion in revenues. 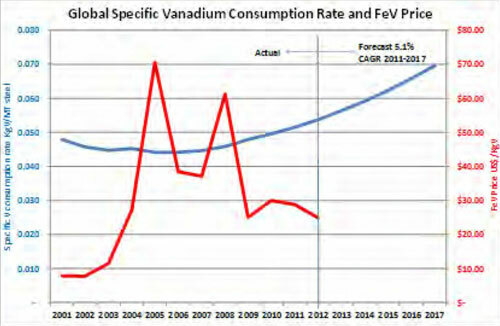 TTP estimates that vanadium supply will grow by 8.7% and demand by 9.2% CAGR between 2011 and 2017. TTP anticipates that market conditions will tighten between 2013 and 2017 as consumption of vanadium runs slightly ahead of production and given relatively low current global inventory levels. TPP estimates that vanadium demand will rise to about 120,000 tonnes by 2017. Titanium (chemical symbol Ti) is a lustrous transition metal with a silver color, low density and high strength. It is high resistant to corrosion in sea water, aqua regia, and chlorine. The element occurs within a number of mineral deposits, principally rutile and ilmenite, which are widely distributed in the Earth’s crust and lithosphere, and it is found in almost all living things, rocks, water bodies, and soils. The most useful properties of titanium are corrosion resistance and the highest strength-to-density ratio of any metallic element. In its unalloyed condition, titanium is as strong as some steels, but less dense. Titanium can be alloyed with iron, aluminium vanadium, and molybdenum, among other elements, to produce strong, lightweight alloys for aerospace (jet engines, missiles, and spacecraft), industrial process (chemicals and petro-chemicals, desalination plants, pulp, and paper), automotive, agri-food, medical prostheses, orthopedic implants, dental and endodontic instruments and files, dental implants, sporting goods, jewelry, mobile phones, and other applications. About 95% of all titanium ore is destined for refinement into titanium dioxide (TiO2), an intensely white permanent pigment used in paints, paper, toothpaste, and plastics. It is also used in cement, in gemstones, as an optical opacifier in paper, and a strengthening agent in graphite, composite fishing rods and golf clubs. TiO2 powder is chemically inert, resists fading in sunlight, and is very opaque: it imparts a pure and brilliant white color to the brown or gray chemicals that form the majority of household plastics. 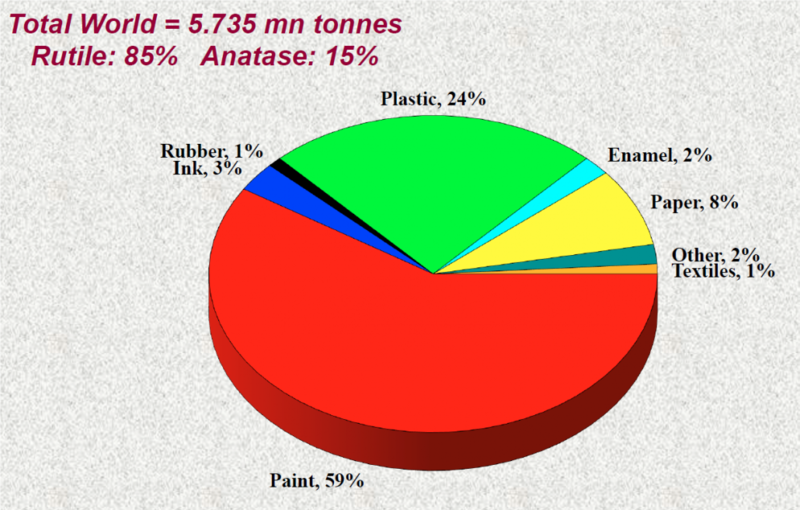 Paint made with titanium dioxide does well in severe temperatures and marine environments. Pure titanium dioxide has a very high index of refraction and an optical dispersion higher than diamond. In addition to being a very important pigment, titanium dioxide is also used in sunscreens. Because of its high tensile strength to density ratio, high corrosion resistance, fatigue resistance, high crack resistance, and ability to withstand moderately high temperatures without creeping, titanium alloys are used in aircraft, armor plating, naval ships, spacecraft, and missiles. For these applications, titanium is alloyed with aluminium, zirconium, nickel, vanadium, and other elements to manufacture a variety of components. In fact, about two third of all titanium metal produced is used in aircraft engines and frames. Because it is highly resistant to corrosion by sea water, titanium is used to make propeller shafts, rigging, and heat exchangers in desalination plants. Welded titanium pipe and process equipment (heat exchangers, tanks, process vessels) are used in chemical and petrochemical industries primarily for corrosion resistance. 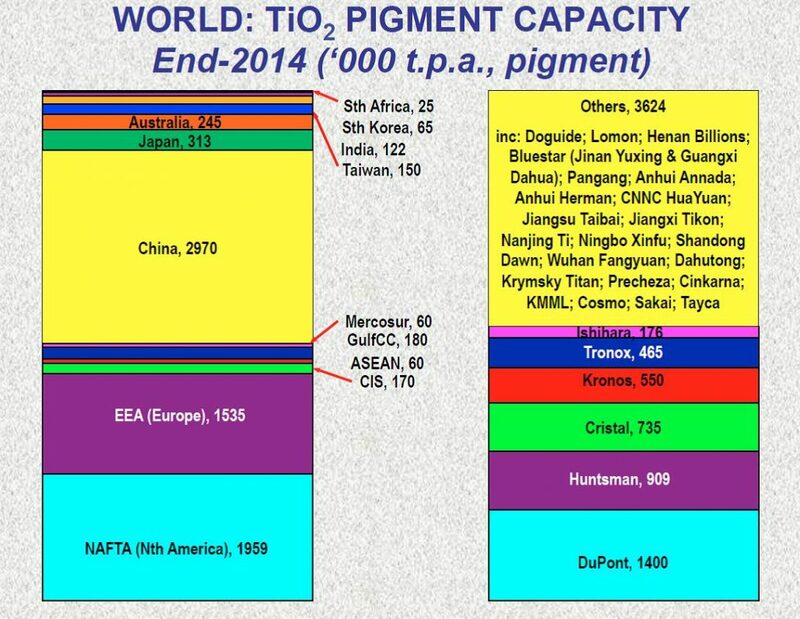 The major global producers of TiO2 pigments are Chemours (demerged from DuPont), Cristal, Huntsman, Tronox, Kronos and Ishihara Sangyo Kaisha. The capacities of these companies are shown in the following figure, which also shows the geographic distribution which shows the strong Chinese position, in terms of total production volume. Titanium dioxide is one of the best white pigments on the market in terms of performance. Over the past decade, the global titanium dioxide market has been growing steadily, with an AAGR of about 5.0%. In 2015, the global titanium dioxide market size hit EUR10.17 billion, up 3.7% year on year. In 2016 – 2020, the global market size is expected to present a CAGR of around 4.5% and reach nearly EUR13 billion in 2020. 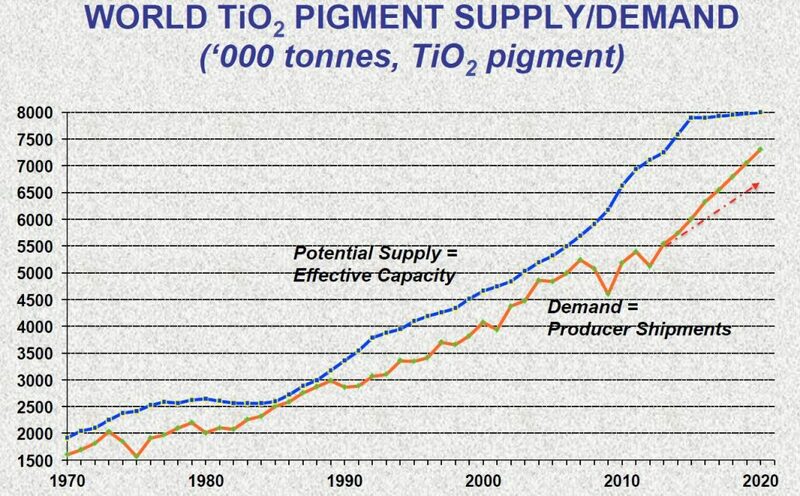 Global TiO2 Pigment Supply and Demand Trend. Global and China Titanium Dioxide Industry Report, 2016-2020. Research In China, Aug 2016. Iron is a chemical element with symbol Fe. It is by mass the most common element on Earth, forming much of Earth’s outer and inner core. It is the fourth most common element in the Earth’s crust. Elemental iron is reactive to oxygen and water. Fresh iron surfaces appear lustrous silvery-gray, but oxidise in normal air to give hydrated iron oxides, commonly known as rust. Iron oxides occupy more volume than the metal and thus flake off, exposing fresh surfaces for corrosion. Pure iron is relatively soft, but it is significantly hardened and strengthened by impurities, in particular carbon, from the smelting process. A certain proportion of carbon (between 0.002% and 2.1%) produces steel, which may be up to 1000 times harder than pure iron. Steels and iron alloys formed with other metals are by far the most common industrial metals because they have a great range of desirable properties and iron-bearing rock is abundant. Iron is the most widely used of all the metals, accounting for over 90% of worldwide metal production. Its low cost and high strength make it indispensable in engineering applications such as construction of machinery and machine tools, automobiles, the hulls of large ships, and structural components for buildings. Since pure iron is quiet soft, it is most commonly combined with alloying elements to make steel. Commercially available iron is classified based on purity and the abundance of additives. Carbon steel contains 2.0% carbon or less, with small amounts of manganese, sulfur, phosphorus, and cilicon. Alloy steels contain varying amounts of carbon as well as other metals, such as chromium, vanadium, molybdenum, nickel, tungsten, etc. Their alloy content raises their cost, and so they are usually only employed for specialist uses. One common alloy steel, though, is stainless steel. Recent development in ferrous metallurgy have produced a growing range of microalloyed steels, also termed “HSLA” or high-strength low alloy steels, containing tiny additions to produce high strengths and often spectacular toughness at minimal cost. In April 2016, The World Steel Association (worldsteel) has released its Short Range Outlook (SRO) for 2016 and 2017. Worldsteel forecasts that global steel demand will decrease by -0.8% to 1,488Mt in 2016 following a contraction of -3.0% in 2015. In 2017, it is forecast that world steel demand will return to growth of 0.4% and will reach 1,494Mt. Steel demand in some emerging economies continues to perform below expectation. But India’s prospects are brightening due to low oil prices, the reform momentum and policies to increase infrastructure and manufacturing output. India’s steel demand will increase by 5.4% in both 2016 and 2017 reaching 88.3Mt in 2017. In Turkey, steel demand is expected to grow by 3.3% in 2016 and 3.2% in 2017, supported by the government’s focus on pro-growth economic policies and low oil prices. Steel demand in the ASEAN 5 (Thailand, Malaysia, Vietnam Indonesia, Philippines) is also expected to maintain a growth rate of around 6% despite their exposure to China due to their infrastructure building activities and will reach 74.6Mt in 2017. Steel demand in the emerging and developing economies excluding China is forecast to grow by 1.8% and 4.8% in 2016 and 2017 respectively. Steel demand in these economies will amount to 457.1Mt in 2017, accounting for about 30% of world steel demand. While developed economies are also feeling the effect of the worsening global economic environment, they are expected to maintain a stable recovery momentum. Steel demand in the developed economies will grow by 1.7% in 2016 and 1.1% in 2017. World Steel Association, Press Release worldsteel Short Range Outlook 2016-2017, 13/04/2016.